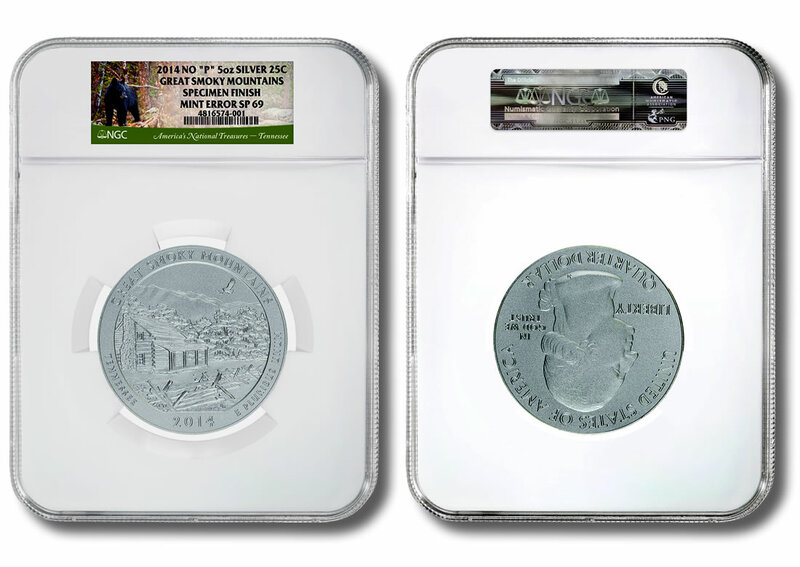 Numismatic Guaranty Corporation (NGC) has identified missing mintmarks on a handful of 2014 Great Smoky Mountains America the Beautiful 5-Ounce Silver Coins. These coins have a reverse showcasing a historic log cabin found within the national park in Tennessee. America the Beautiful coins were introduced by the United States Mint in 2010, and they will continue until at least 2021. Five different designs are released annually with each honoring a unique site of national interest. Each design appears for a time on quarter dollars, on 5-ounce silver uncirculated coins for collectors, and on 5-ounce silver bullion coins for investors. Both 5-ounce versions are produced at the U.S. Mint’s facility in Philadelphia. The bullion issues have a brilliant, reflective finish and no mintmark while the collector uncirculated issues have a "vapor-blasted" matte finish and carry the Philadelphia Mint’s "P" mintmark. The bullion coins are sold through U.S. Mint Authorized Purchasers while the uncirculated coins are sold directly to consumers by the U.S. Mint. A sharp-eyed NGC grader was surprised to find four 2014 Great Smoky Mountains 5-Ounce Silver Uncirculated Coins that were missing the "P" mintmark. They were submitted by Modern Coin Mart, an NGC Authorized Dealer, as part of a larger group of Great Smoky Mountains 5-Ounce Silver Uncirculated Coins. "It is exciting to find such a significant mint error several years after these coins were issued," said David J. Camire, NGC Finalizer and mint error specialist. "This shows that you should always look closely at your coins, even special issues sold by the U.S. Mint." All of the coins had arrived at NGC in standard U.S. Mint packaging for uncirculated 5-ounce issues and the error was unnoticed until the first NGC grader examined them. A fifth example was discovered in a separate submission. Camire believes the error happened when coins intended to be sold as bullion versions (and therefore without the "P" mintmark) were accidentally mixed with coins designated to be vapor-blasted, which happens after the coins are struck. The vapor-blasted missing mintmark coins were then individually packaged along with the other uncirculated issues and sold by the U.S. Mint. It is not known how many of these errors were released, or if others await discovery. The Great Smoky Mountains 5-Ounce Silver Uncirculated Coin launched on April 7, 2014. Issued for $154.95 apiece, they reached final unaudited sales of 24,710. The Great Smoky Mountains 5-Ounce Silver Bullion Coin was released on March 17, 2014 with distributors selling them for a small premium above their melt value. The U.S. Mint temporarily ran out of coins on April 21, 2014 when sales reached 23,000. Their sales resumed May 5, 2014 and continued until the coin sold out at 33,000 on September 30, 2014. The missing mintmark coins have been attributed as 2014 No "P" with the Mint Error designation on the NGC certification label. NGC recognizes most major mint errors under its Mint Error service tier. Interesting. I wonder how many more are out there and what is it worth?